In recent years students from Australia, Hong Kong, Singapore, Malaysia, Japan, China, Brazil, Taiwan, French Polynesia and New Zealand have trained at the School. Most have gone on to successful international careers. Students from New Zealand, Australia, Niue, the Cook Islands and Tokelau are classified as domestic students for the purposes of study in New Zealand. The School has support systems in place to assist international students. A pastoral care manager provides advice to help students adjust to full-time training and life in New Zealand. 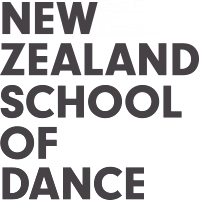 The New Zealand School of Dance has agreed to observe and be bound by the Code of Practice for the Pastoral Care of International Students published by the Minister of Education. The code is published in a number of different languages and is available from the New Zealand Qualifications Authority. These fees do not include course-related costs. Uniform costs are additional and will be advised. All students must also pay a Student Services Levy each year. Payments must be made in New Zealand dollars, and include all bank fees/charges, both in the country of origin and New Zealand. Tuition fees must be paid in full at or before the beginning of Term One. The school reserves the right to only admit fee paying students to classes. Tuition fees must be paid before a student visa can be applied for. Students from New Zealand, Australia, Niue, the Cook Islands and Tokelau are classified as domestic students for the purposes of study in New Zealand and will pay the fee for domestic students. The School is required by New Zealand Qualifications Authority (NZQA) to provide protection of student fees. The School meets this requirement through the services of the Public Trust. International students are not eligible to access any New Zealand government-funded loans or allowances to help cover their study costs. International students must have a visa to study in New Zealand. Students accepted into the New Zealand School of Dance full-time course are eligible for a New Zealand Student Visa. For full details on visa applications, employment in New Zealand while studying, and reporting requirements visit the Immigration New Zealand website or email the NZSD Pastoral Care Manager. Most international students are not entitled to publicly funded health services while in New Zealand. Students who receive medical treatment during their visit may be liable for the full costs of that treatment. The New Zealand School of Dance is required to ensure that each international student has appropriate and current medical and travel insurance for the duration of their planned study period at the School. The NZSD Pastoral Care Manager will arrange insurance for international students with Uni-Care from the date of travel to New Zealand.